Yellow-bellied Marmot near parking lot. This one kept trying to crawl into the underside of my car. The Yellow-bellied Marmot is found in western North America. It is essentially the western equivalent of the Woodchuck (groundhog). It is of a similar build to the Woodchuck but has a yellowish underside. 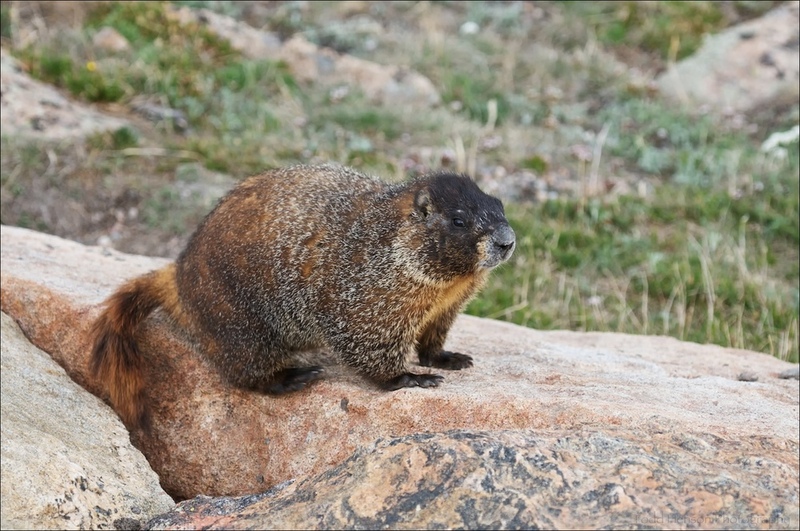 Instead of living in grassy fields the Yellow-bellied Marmot lives in mountains in rocky areas. The Marmots I encountered in the Rocky Mountains were so used to people they had no fear. They would come up within a foot, going about their business as if you weren't even there, with one exception. One particular Marmot kept scurrying under my car trying to crawl into the underside of it. It was a bit of an effort assuring it wasn't there before I drove off.